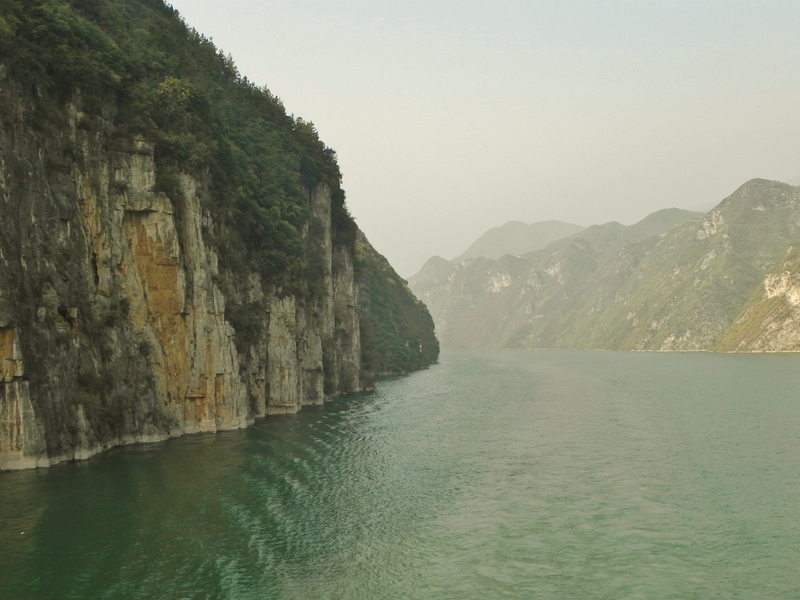 Got up early this morning (6:45 am) to see the first of the famous Three Gorges, Qutang Gorge, which we entered at about 7:15. 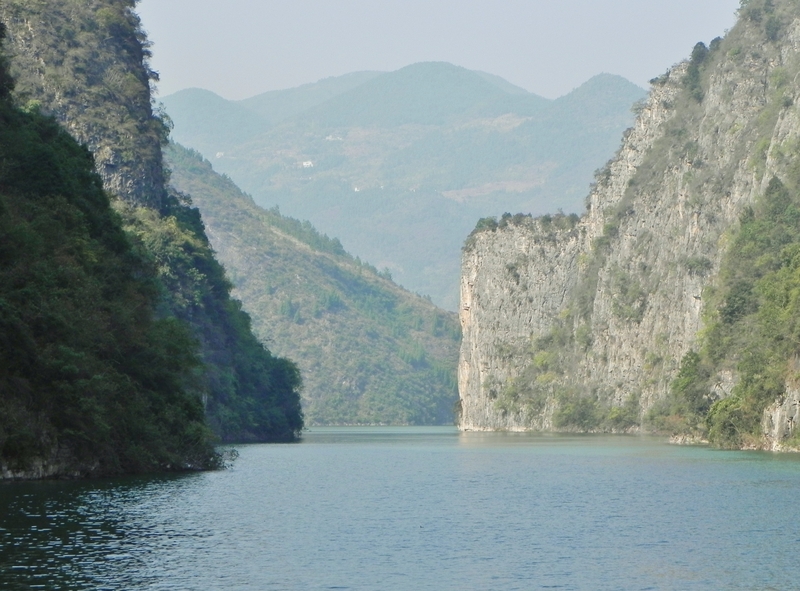 It’s billed as the most dramatic of the Three Gorges. Lots of early morning haze, so pics will be iffy. The sun was just coming up. 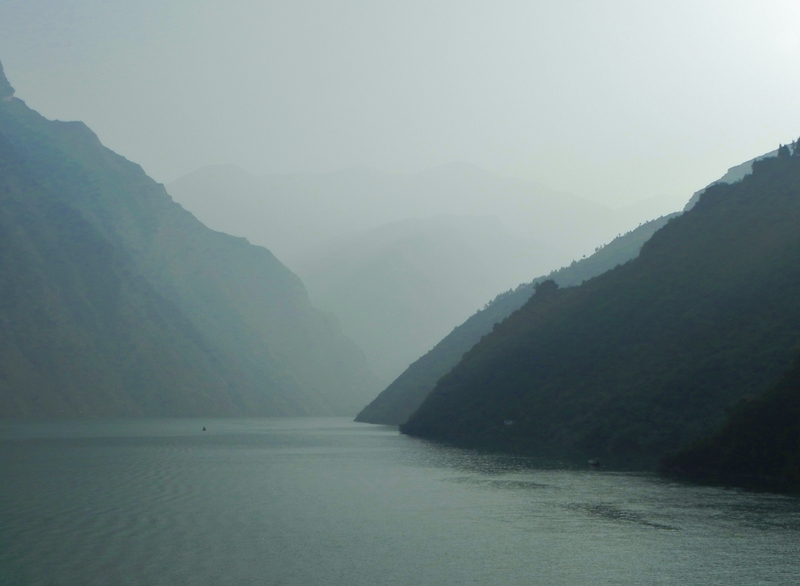 This section of the Yangtze is very sparsely populated – only saw one tiny village and it was accessible only by boat. Can’t imagine how it must have looked before the dam flooded everything. 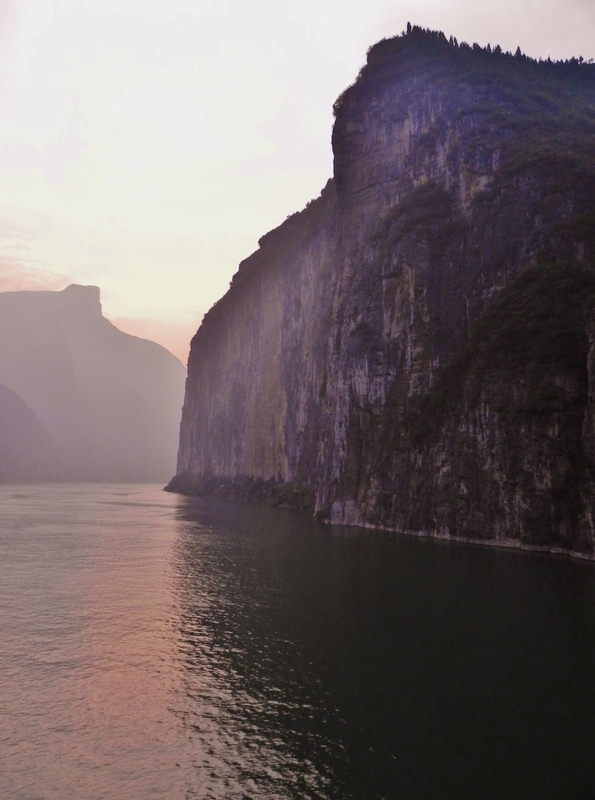 It’s quite dramatic as it is – sheer cliffs plunging right into the water. The spectacular scenery only lasted about 20 minutes though. By now I was hungry and craving a cup of tea, so I went for “mama huhu” (means so-so, remember?) breakfast. I’m still really congested by my cold, but at least I’m not sick anymore. At 9:00 am we entered the Wu Gorge. The sun finally came out. Though still just a tad hazy, we finally saw something vaguely approaching blue skies. 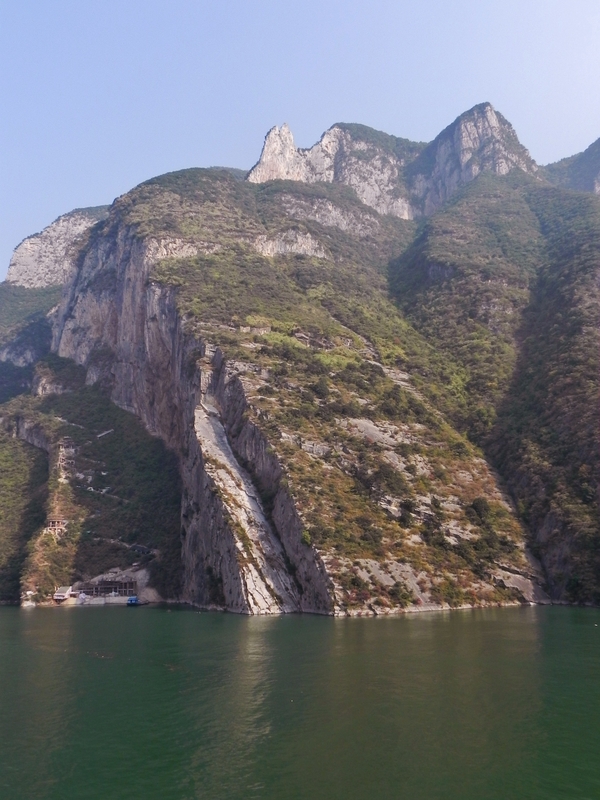 I thought this Wu Gorge was better than the Qutang Gorge. But perhaps it was the good weather. We passed by the Goddess Peak and for once the sun was in the right place for pictures. There were also interesting sights to see on shore, in addition to this marvelous scenery. 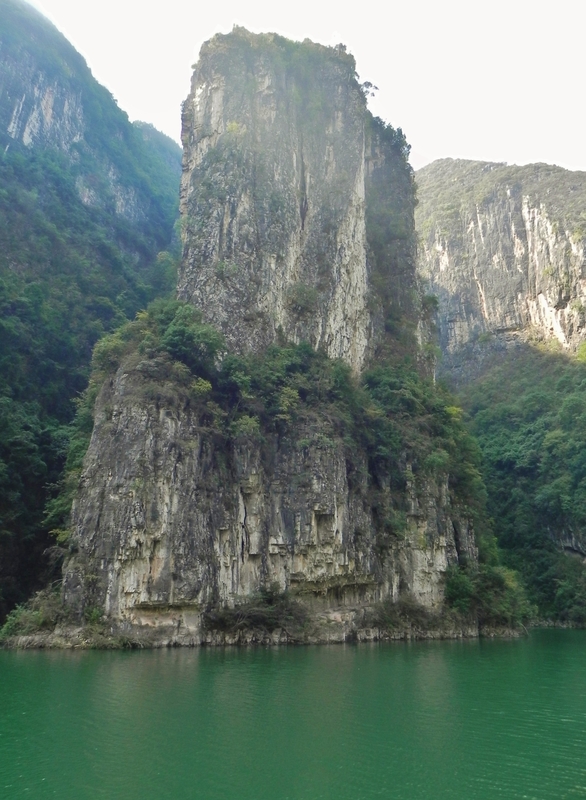 Caves dotted the steep hillsides – not sure if natural or manmade. Strange outcroppings of jutting rock. And every once in a while, a pagoda would adorn the cliff side. It was a bit chilly up on the top sun deck, and DH was huddled under his parka on one of the few deck chairs – I was out in short sleeves and was loving the fresh breeze. Of course, I was running around like a jack rabbit taking pictures, and he was sitting still. Imagine our surprise while peacefully cruising along, coming around a bend, this should appear out of nowhere. The juxtaposition of Chinese culture is sometimes startling. Right after this, we were back in the wilderness. 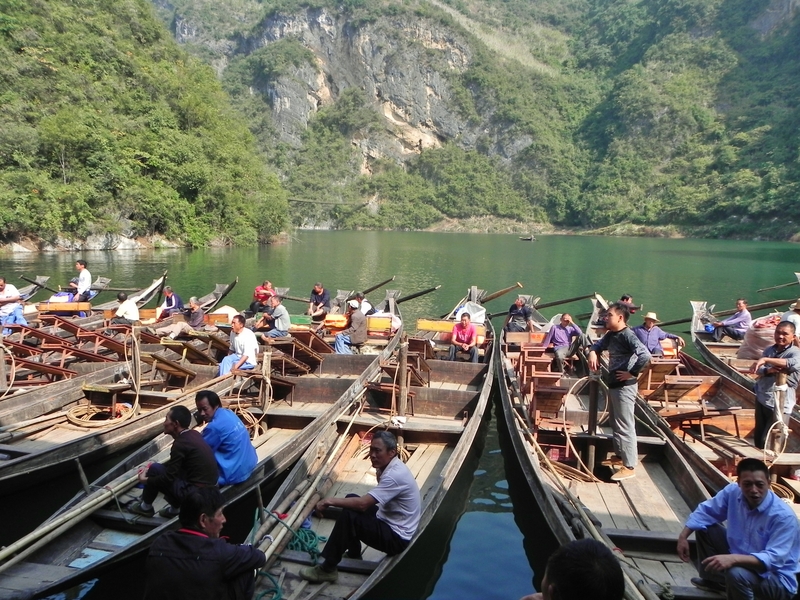 At the end of the Ferry ride, there was a little “terminal” with hundreds of peapod boats waiting to take us further upstream. Again, we were the first to go – fantastic! We got into our “peapod” boat without too much difficulty. 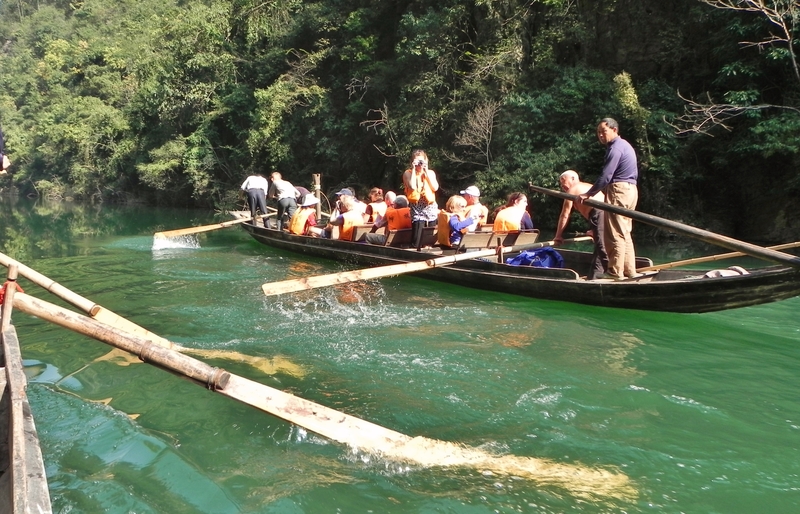 These are pretty crude wooden boats that normally hold 10 to 12 people, but us “special” 6 people had a boat of our own! This peapod boat was rowed by 5 boatmen with oars. Interestingly, they never put the oars in perpendicular to the water, but always had them slanted. In the old days, to get up this river, “trekkers” would tow the boats up the river with ropes because the current was too strong to row in many places. 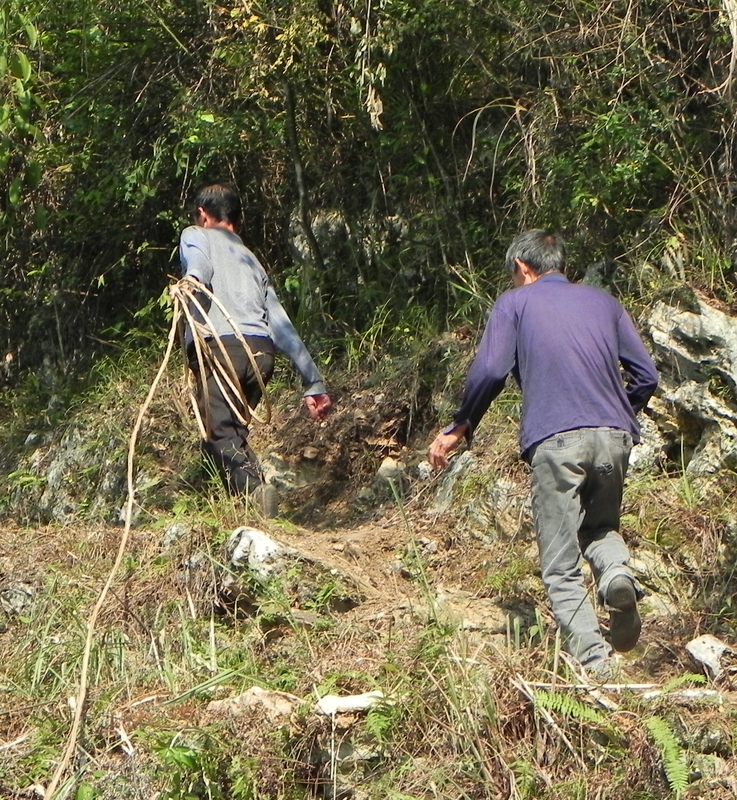 Trekker paths are carved into the mountainsides where they used to walk to pull the boats. In many places these paths were on the sheer cliff face and men would slip and fall to their deaths. 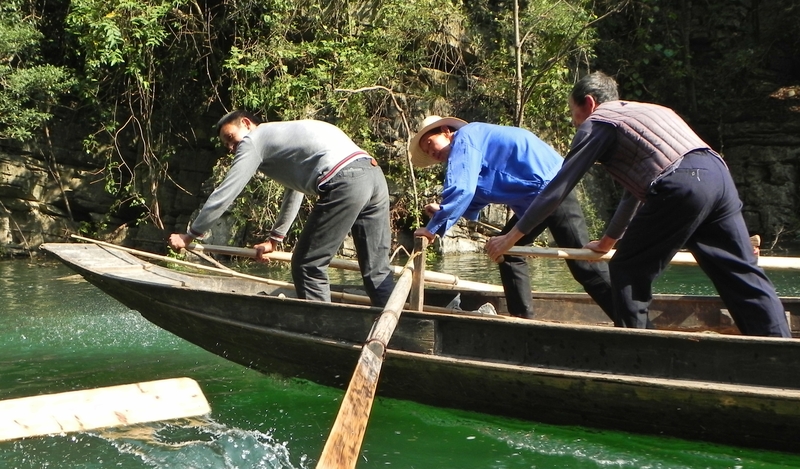 So, they had a reenactment of trekkers pulling our boat, but it was a bit of a joke – the line was slack all of the time. But our rowers worked very, very hard – no motors here. Strong, these little guys are! And they stayed in amazing rhythm with each other. 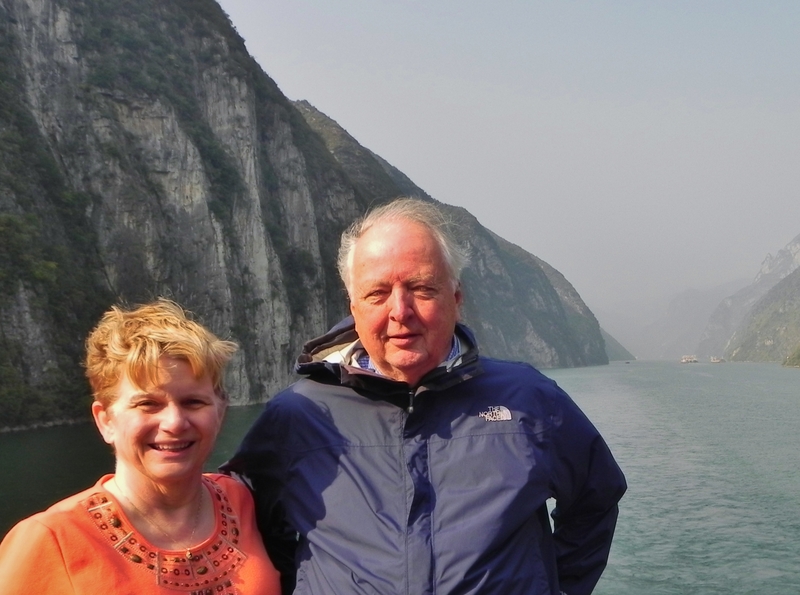 Our local guide (Michelle) is a member of the TuJia minority. She taught herself English (she was a bit difficult to understand but not too bad). 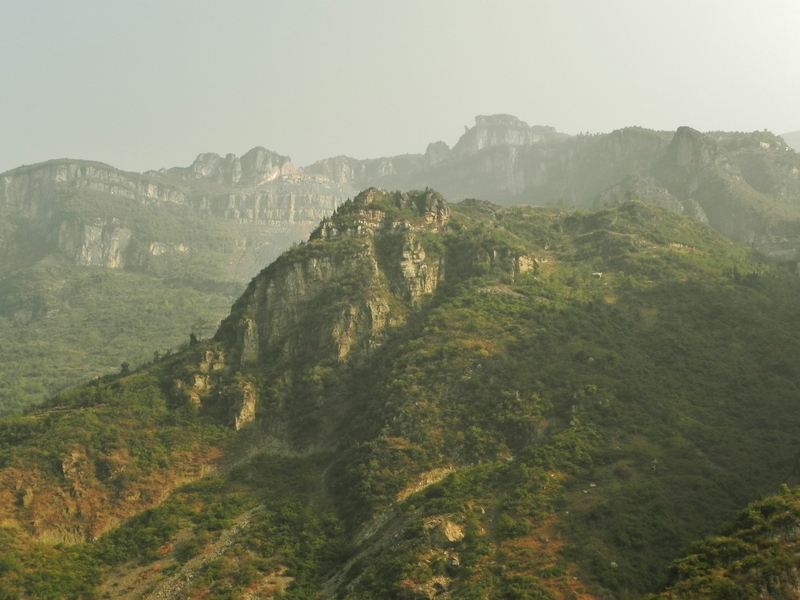 In winter she goes to her village up Shennong Stream where her parents look after her daughter all the time. Her husband works in a factory making shoes. She sang one of the traditional TuJia minority songs about a long-lost love. She had a lovely voice. Sales pitch came right after the song – bought a DVD (probably find out it’s all Chinese or doesn’t play at all) but not the book. DH was proud of me for not buying the book. Hanging overhead, crossing Shennong Stream, a footbridge for locals swings gently in the breeze. Just my kind of bridge! Dramatic scenery in this part of Shennong Stream reminded us of some of the isolated places we had seen in Alaska, but obviously more tropical in the vegetation. Very lovely. And lots of fun too. Back at the peapod terminal, we disembarked the peapod boats and reboarded the Ferry Boat. As beautiful going back downriver as it was coming up. Got a picture of the crevice where the hanging coffin is to be found, but had to really strain the imagination to actually see the coffin. Not sure what all the buzz is about to be honest – the scenery is more fantastic than an old wood coffin. However, it is amazing to picture how the ancient Ba people (a Bronze Age culture) suspended them from these heights, over 1,000 years ago. We got back to the ship just in time for my 4:00pm, 60-minute foot massage. FABULOUS! Much better than my full body massage yesterday. Started off with my feet in a wooden bucket of hot water, sitting on a bench while she massaged my back, arms and hands. Terrific! Then sat in a reclined chair while she worked on my feet for the next 45 minutes. Got my whole hour this time. My feet feel like marshmallows.